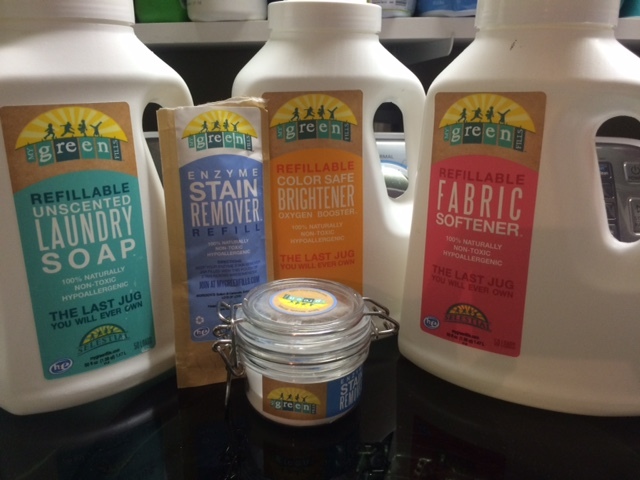 My Green Fills Natural Laundry Detergent, Softener, Stain Remover + FREE JUG OF DETERGENT! Laundry… the inevitable chore. While you may lose a sock or two in the process ( I always do…), have you ever wondered what exactly is in your detergent, that you are then putting on your skin? After all, you use it to clean your sheets, pillow case, and clothing, it WILL hit your skin at some point! 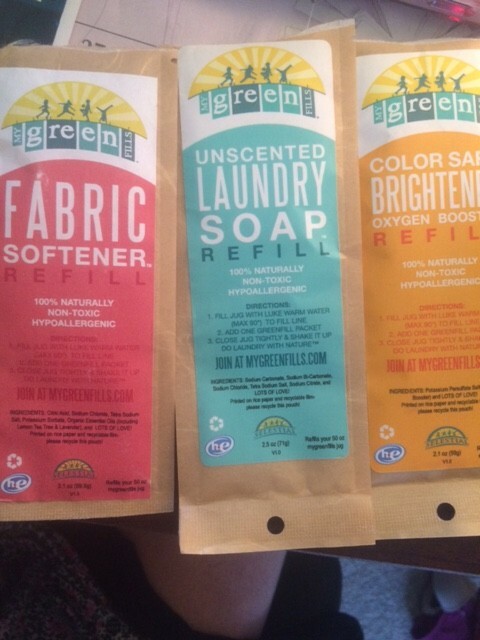 I was sent My Green Fills natural Laundry Detergent, Softener, Color Safe Brightener and Enzyme Stain Remover. I was excited to try these, because I have very sensitive skin. I use detergent that has no scent or dyes, and just cleans the clothing without leaving much residue behind. Harsh detergents make my skin break out, which is very unpleasant! These products by My Green Fills are non toxic, hypoallergenic, vegan, cruelty free, HE washer friendly, and chlorine free. How is works is you get one jug that you recycle and use over and over again, and you get refills of a powder that you add to the jug with warm water, and voila! Liquid detergent. This is environmentally friendly, since you are reusing the jugs and saving companies from producing more plastic. Each bundle of refill + powder is 12$, which can be purchased at their website. The powders come in a rice paper package, which is recyclable, and sturdy. The package is filled with a white powder. First, you add warm water to the fill line of your plastic jug. Then you add the entire packet to the jug, close the lid and shake! It was super easy to mix. We accidentally added the powder first and THEN the water to one of the jugs….don’t do that! It started to bubble before we could close the lid! LAUNDRY SOAP– this one is unscented. I used it with the FABRIC SOFTENER. Both hypoallergenic, 100% natural and non-toxic. The Fabric softener smelled of lemon and herbal type of smells, almost like lavender. I really liked the smell of it, since it was gentle but went well for a laundry aroma. I had 0 problems with both of these regarding my skin. No breakouts, no irritation, nothing. The clothes came out of the dryer soft, which was exactly what I wanted. I wish the odor of the fabric softener stayed with the clothes once they were dry, it did disappear. This could be since it is a natural product, so I will take the loss over a harsh chemical scent. The clothes just smelled like nothing- like clothes- but were soft and non irritating. The COLOR SAFE BRIGHTENER OXYGEN BOOSTER– just as promised, color safe! There was no bleeding of colors. We all know that the more you wash bright clothing, the more “dingy” it gets. This product helped prevent the dingy-ness, and kept my bright colors bright. I wear a LOT of bright clothing too…lime green, hot pink, you name it, I most likely own it. So this is a great product for me to have with all my bright gym clothes and pants. Lastly, the ENZYME STAIN REMOVER. This one you DO NOT add water to! You just add it into the wash. We cheated a little bit and made a little paste out of it and put it on a really hard stain. To be fair, this stain was an older, set in stain. 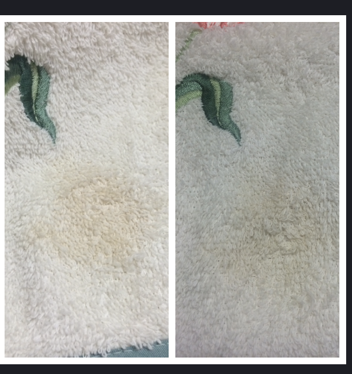 While it did not get rid of it completely, it definitely lightened up the stain, which made Mama happy (it was her towel). You can see below, LEFT is before, and RIGHT is after. Overall, I am happy with these products. I will definitely use and buy the detergents in the future. They are only 9 dollars for a refill, which isn’t bad at all, and it lasted us a while (family of 4!). It is a bit more expensive than say a traditional brand you can get at the store, but I am willing to pay extra for something environmentally friendly, and that is easy on my skin. ALSO, you get free shipping. Score! Overall, 4 stars. HOW TO GET A FREE JUG! The nice folks over at MyGreenFills are giving YOU a free jug of their product for you to try! I received these products for free. This is an unbiased review.